The War Against Wheat- Will Our Health Win? What’s at the base of your food pyramid? Is it whole grains? Have you ever stopped to ask why? As we know, whole grains are the base of just about every “healthy” food pyramid. The American Heart Association recommends at least 3-5 servings of whole grains per day for optimal healthy nutrition. It’s simply accepted that whole grains are good for us. So why are so many waging a war against whole grains? Just look at the bestsellers on Amazon and you will find Wheat Belly, by Dr. William Davis, Grain Brain by Dr. David Perlmutter, plus a slew of books promoting low carb nutrition. Do they know something the AHA doesn’t? It turns out, they just might. It is time to start asking the questions, how do we know whole grains are healthy? What’s the evidence? First, people living in Blue Zone communities (those where people routinely live the longest) eat vegetables fruits, nuts, seeds, legumes and whole grains. Since they routinely have better health than most other populations, that must mean whole grains are healthy, right? Not so fast. People living in the Blue Zones also sleep 8 hours per night, they get regular physical activity, they have close social connections, they enjoy life and have a purpose for waking up every day, and they do not eat many sugars or processed junk food. Plus, they eat vegetables, fruits, nuts, seeds and legumes. How could we possibly say the whole grains themselves are what keeps them healthy? Are they healthy because of the whole grains? Or does the rest of their healthy activities outweigh the unhealthy effects of the whole grains? Luckily, we have studies that tried to answer that question. Studies looking at replacing white flour with whole grains consistently showed health improvements in those easting whole grains. Easy answer. Whole grains must be healthy. Again, not so fast. That only tells us that whole grains are healthier than processed white flour. That should not be a surprise. Said another way, they are less bad than white flour. But are they healthy? Or are they necessary? It turns out, grains are not necessary at all for health or for survival. You heard that right. Fats and proteins are considered essential nutrients. Our bodies cannot make all the fats and proteins we need, so we must eat them. That Is not the case for grains and carbs. Our bodies get all the fuel they need from converting fats and proteins to glucose or other fuel sources such as ketones. OK. We have established that grains are not necessary. But do they add anything to a diet consisting only of fats and proteins? Fiber. The whole grains that show the greatest health benefits, compared to white flour, are those with the highest fiber-to-carbohydrate ratio. That makes sense. 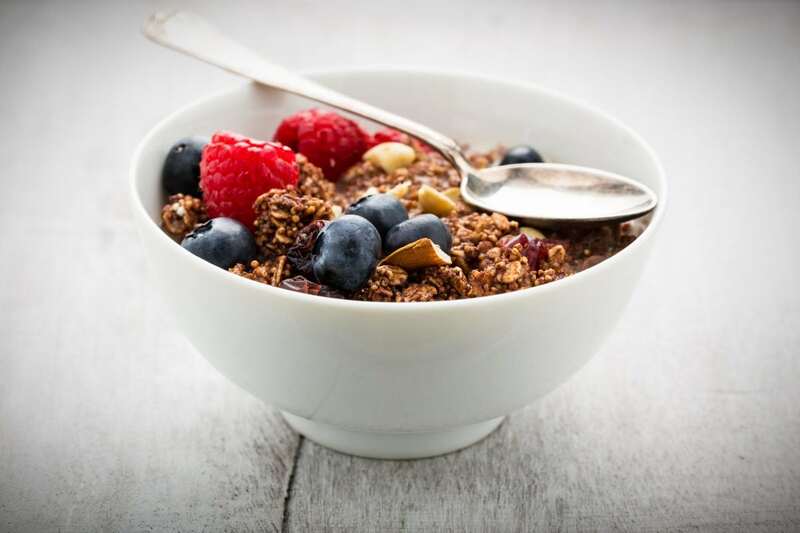 Fiber is a key component to healthy eating, and whole grains can be a good source of fiber. Lucky for us, we have a bounty of choices from where we can get our fiber. Vegetables, fruit, nuts, seeds and legumes are fantastic sources of fiber. If fiber is our goal, we once again see that grains are not necessary. But are they harmful? Listening to William Davis, and reading his book Wheat Belly, will certainly convince you that they are. For some, the answer is clear. If someone has celiac disease, or gluten sensitive enteropathy, the proteins in wheat cause an autoimmune reaction that attacks their intestinal lining. There is no question that they need to avoid wheat and grains. What if someone does not have celiac disease? Some are still sensitive to gluten or other elements of grains (some studies show it may be other components of grains called the FODMAPs instead of the gluten). Although there is no clear diagnostic test for this, we can subjectively test it very simply. Go for 30 days without wheat and grains and see if you feel better. Do you have more energy? Do you feel less bloated? Less achy? Do you sleep better? Do you think more clearly? If the answer is yes, then you too should avoid wheat and grains. So far, this should be pretty intuitive. But what if you do not feel any better off grains? Is there still a reason to avoid them? At this point we need to better define our enemy. Is gluten inherently evil for everyone? Well then, are FODMAPS inherently evil for all? Is there something that is evil for all? It’s true that we do not all need to avoid gluten. In fact, gluten-free foods may be far worse for our health than gluten containing whole grains. A recent study suggested that low fiber, gluten free foods increased heart disease risk compared to higher fiber whole grains. Again, this proves whole grains are less bad than something really bad. That makes sense. But wheat, grains and flour are not comprised of only gluten. They are a mix of carbohydrates and other grain proteins. And what do those carbohydrates do? Raise your blood glucose and insulin levels. “Healthy” whole grains have a glycemic index on par with a snickers bar! Admittedly, glycemic index is not a perfect measure, but it is an accurate assessment of how quickly and strongly a food induces a glucose (and subsequently, an insulin) spike in your blood. For reference, white bread has a GI of 73, 100% Whole Grain Bread 51, Coca Cola 63, Snicker’s 51, oatmeal 55, cashews 22, broccoli 10, and cauliflower 10. Also for reference, spinach, salmon, beef, chicken and eggs have a GI of zero. Do you see a pattern? Food that comes from wheat and grains, no matter how “Whole,” significantly raise our blood sugar and insulin. Real food, vegetables, meats, etc. do not. Our bodies were never meant to eat grains or wheat. The agricultural revolution and production of wheat and grains has only existed for less than 0.1% of our evolution. Some would argue that is enough for us to avoid them. That’s not supported by evidence. But it does make sense (remember, this is an article on health, not about the economics of agricultural wheat production, government subsidies, worldwide famine or other issues outside larger than I care to tackle). Again, the question comes back to, why are we eating them? Not because of physiological need. Not for health (as long as we can get fiber elsewhere). We eat grains and wheat for taste, for convenience (since our society has evolved into a grain-centric society), and possibly for addiction (or at least a stimulated craving). That’s enough for me. Is it for you? I don't think there is any kind of food that someone hasn't found something "bad" in, including things like meat, nuts, seeds, beans and fruit. Pretty much everything we eat has some sort of down side, at least for many if not all people. Our bodies have simply evolved to successfully deal with all those naturally occurring toxins, "anti-nutrients" etc. — up to a degree. Real health problems only occur when we consistently over do it with any one of those potentially problematic substances. Unfortunately it appears as if when we compare modern American dwarf wheat, a.k.a. "Frankenwheat," to ancient strains of wheat like einkorn, the number of different types and the amount of each type of problem substance has exploded. Dr. Mark Hyman wrote an excellent and very long post about this on his web site, called "Three Hidden Ways Wheat Makes You Fat." Then on top of that, much (perhaps even most) of the wheat grown in America today has also been drenched with glyphosate (Roundup) as a desiccant before harvesting. Glyphosate has been patented as an antibiotic, so it's hardly surprising that it wrecks havoc on our gut microbiomes which in turn causes still more inflammation and possibly intestinal permeability with all of the problems that that can lead to. I personally don't eat very much wheat at all, but when I do, I just avoid non-organic Frankenwheat like the plague. If I eat a serving of organic einkorn wheat pasta once a week or so as a side dish, it doesn't appear to create any kind of problem that my body can't just shrug off and get on with life. So I just continue to enjoy eating it on occasion. It's not something I'm going to get "orthorexic" about. But I can easily understand how people who use breads and other wheat products as staples in their diet could be asking for trouble, and might at least seriously consider switching over to organically grown traditional strains of wheat whenever possible. Thank you for your comment. That sounds like a very educated and reasonable aproach that sounds like it is working well for you. Thanks for sharing! – fruits – and I do understand the argument re the domestication of fruits. I wonder what you have to say about the traditional Indian vegetarian diet? Finding it very hard to square with everything here. I am myself fasting and doing the low-carb thing and understand the science behind everything. But I want to hear how the Indian vegetarian emphasis on traditionally grains, legumes, beans (incl. the long fermentation/soaking etc) squares with your philosophy. Thanks for your comment. I think one important point to clarify is the issue of insulin sensitivity. If someone is very insulin sensitive, then root veggies and fruits likely wont raise blood sugars significantly. They may raise insulin, but we rarely measure that as a metric. So, if you take a population that is physically active, thin, and metabolically healthy, carbs are not as immediately dangerous. Here in the US and most industrialized countries, the majority of our population suffers from some level of insulin resistance. That is where whole grains, fruit and root veggies cause unhealthy rises in insulin and blood glucose. A CGM is a very powerful tool to see this rise. I highly recommend one for everyone to learn their individual responses. Thanks again for your comment! Next Next post: Is a Low-Carb Diet the Key to Treating Alzheimer’s?